Such is the conversation I imagined taking place today between Sam Presti (general manager of the Oklahoma City Thunder) and Danny Ainge (general manager of the Boston Celtics). I imagined this conversation right after I heard that the Thunder were sending Jeff Green and Nenad Krstic to the Celtics for Kendrick Perkins and Nate Robinson. As the following table indicates, Green and Krstic – the starting power forward and center for the Thunder – are the least productive members of the Thunder. Entering the 2010-11 season, the Thunder had five NBA veterans who posted above average WP48 [Wins Produced per 48 minutes] marks last season (average WP48 is 0.100). This season – after 56 games – these five players (Kevin Durant, Russell Westbrook, Thabo Sefolosha, Serge Ibaka, and James Harden) are again posting above average marks. But the remainder of the roster this season – just as we see when we look at performances in 2009-10 – is still below average. Consequently, the Thunder’s efficiency differential (offensive efficiency minus defensive efficiency) is only 2.59. Such a mark is consistent with a team that would win about 33 of their first 56 games. So although the Thunder have won 36 games and currently are in first place in the Northwest division (and hold the 4th seed in the West), Oklahoma City is not contending for an NBA title in 2011. One way this could change, though, is if this team could remove the players who are not really helping. The Thunder have above average players at point guard (Westbrook), shooting guard (Harden and Sefolosha), and small forward (Durant and Sefolosha). But when we look for productive big men, we only see Ibaka. And Ibaka primarily comes off the bench. Once again, starting at center and power forward for the Thunder is Krstic and Green. And those two players have combined to produce -2.4 wins this season. If each player was replaced by just an average player (i.e. 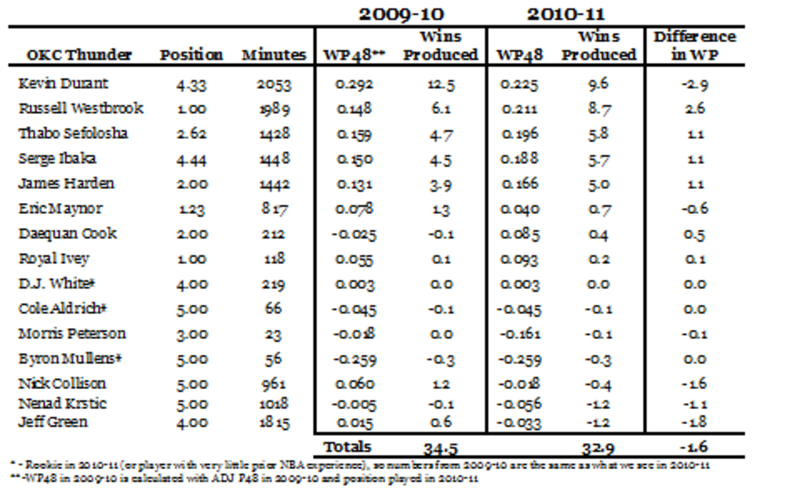 WP48 of 0.100) this season, the Thunder would improve by 8.3 wins across 56 games. To see this, let’s note that the combination of Krstic and Green have played 2,833 minutes this year. Had each been average, these two would have combined for 5.9 wins, or once again, 8.3 more wins than the Thunder have this season (since Green and Krstic combine to produce -2.4 wins). Now if the Thunder won 8.3 more games, the team’s winning percentage would be 0.737. And that mark matches what we see from the Miami Heat this season. Yes, if Krstic and Green were average – again, this is a WP48 mark of 0.100 – the Thunder would be on par with the best teams in the NBA. And this season, Perkins is at 0.081 WP48 (and he has been hurt). So I think we can conclude Perkins is an average center. Acquiring Perkins was not the only move the Thunder made on Thursday. Oklahoma City also acquired Nazr Mohammed from the Bobcats (for Morris Peterson and D.J. White). Mohammed has a career WP48 of 0.116, and last year he posted a 0.199 mark for the Bobcats. This season, at the age of 33, his WP48 mark is only 0.048. But if Perkins and Mohammed can take most of the minutes at center, then Nick Collison and Ibaka can stay out of the middle. And that move will boost the WP48 mark of each player. In sum, it looks like the Thunder – thanks to Danny Ainge – have a chance to be much better. In fact, it is possible that Kevin Durant is suddenly playing for a title contender. Again, all of this is due to the generosity of Danny Ainge. Or was it just payback for Ray Allen? Then again, maybe Ainge didn’t do this to help out the Thunder. 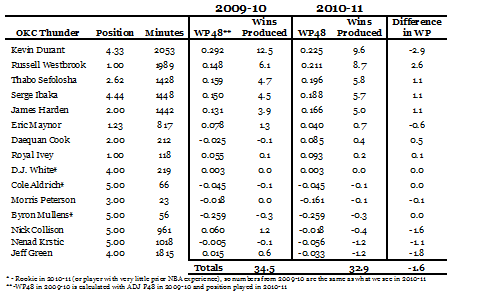 The problem Jeff Green had in Oklahoma City was that he was probably being played out of position. Green is 6-9 and weighs 235 pounds. But although he looks like a big man, relative to an average power forward, Green is below average with respect to rebounds and shooting efficiency. The Celtics, though, don’t need Green to play power forward. Boston already has Kevin Garnett and Glenn Davis at power forward. And Krstic and Shaquille O’Neal can play center. That means Green can spend most of his time at small forward. Green is still below average at small forward, but as a back-up to Paul Pierce, he doesn’t hurt as much. So this move probably didn’t help the Celtics much. After all, Krstic is still not a very good center (but not much worse than Semih Erdan who the team shipped out today). But this move probably doesn’t hurt as much as one might think if they didn’t consider where Green will probably play in Boston. How this move impacts the Celtics, though, isn’t the big story (at least, I don’t think so). If Perkins can be healthy (he his hurt now) and Mohammed can still play, the Thunder have suddenly acquired some players in the middle who won’t hurt them when they take the court. Given the talents of Durant, Westbrook, Sefolosha, Ibaka, and Harden, the Thunder might finally be contenders in the West. And that means, Danny and Sam might be meeting again in June. P.S. Of course, Miami, Chicago, San Antonio, and the LA Lakers might have something to say about this potential meeting. Will Thunder's Kevin Durant be NBA MVP?